We have returned to the USA after 37 days in Myanmar and Thailand. We made it home on Christmas Eve. But that which we have seen and experienced is nothing short of the power and glory of God. It is impossible to tell all but I think I can give you a sense of what God has done. We visited many of our GLBM missionary-pastors. One of them said to me, “Every place where the sole of your foot shall tread God will give you souls. And that is exactly what occurred in every place where we preached the Gospel. We have seen hundreds of Burmese Buddhists, whole village communities, entire households, innumerable children, and even Buddhist monks turn to faith in Christ. In one place we visited a hospital for lepers and every patient, including several Muslims and two Buddhist monks, repented of their sin, turning from idolatry and spirit-worship, putting their faith in Christ alone for salvation. A man who was visiting one of the patients lingered outside an open window and when we began leading people to Christ, he stepped inside the door and asked if he also could believe and receive Christ as his personal Saviour. A school teacher invited us to her home and the room was filled with people who listened to every word we said. I began to speak and then introduced Peter Judson. He carefully presented and explained the grace of God and the Biblical plan of salvation in their heart language. You could see the conviction on their faces and they soon entered the family of God by faith. Since that time they have been to church, making public profession of their faith and will soon be baptized. We visited the Umpium Refugee Camp along the Burmese border in Thailand where ten thousand people have lived for up to twenty years. Their homes are primitive but they have a true community with schools, markets, and some churches. We did our best to encourage the believers there and they want us to return in the near future to preach a crusade. During our last week in Mae Sot, Thailand (along the river border that divides Myanmar and Thailand) Gospel Baptist Church celebrated its 10th anniversary of winning souls and training disciples among the half-million Burmese migrant workers there. 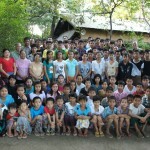 On Saturday, December 20th 700 Burmese children filled our big gospel tent. After the large assembly, classes were held for different age groups and in the Burmese and Thai languages. The afternoon was filled with activities and hundreds of souls were saved. The following day, Sunday December 21, the tent filled again to capacity but this time with adults and teenagers. Dr Peter Banfe delivered a powerful message on the Deity of Christ. Then I was called upon to preach and I spoke from Galatians 4:4. God literally gave me the message while Dr. Banfe was speaking before me. With total assurance and being led by the Spirit of God, I told the Burmese people that “In the fulness of time” 1) Pa Pya Thakin (Father God) was READY to send the Saviour. 2) Mankind was READY for a Saviour – the world was filled with sin. 3) I was READY for a Saviour when I was 13 years old. I was the first one saved in my family. I asked them, “Are you READY for a Saviour – the One whom Gautama (the Buddha) said would come after him. I preached on sin. I preached on Hell. And when I gave the invitation I asked the people to raise their hands if they were READY to put their trust in my Saviour. Hands began to raise across the tent. Then I asked those whose hands were raised to stand among their peers. The people began to stand, then waving their hands at me. And then I saw it! In 35 years of ministry I have never seen people with a longing for the Saviour like I saw that day. Their expressions were as if they were begging me to help them come to my Saviour. I completely broke into tears and led them as they called upon the name of the Lord for salvation. Ten thousand years after we are in heaven I will not forget the look I saw in their eyes that day. Boy in the middle is 15. He has had leprosy since he was nine. One foot is gone. Came to visit a patient friend; got saved while we were there. In a small Burmese village, preaching the Gospel. Nwe Nwe Laing with her mother who was in church for the first time ever. No Comments to "GLBM MYANMAR MISSIONS TRIP – NOV 17 thru DEC 23"